Sometimes appearances are misleading. Released one year earlier, "Forbidden Pastures", WOODEN BABY's previous tape, exhibited clear OZRIC TENTACLES influences. Furthermore, for this new cassette, Merv Pepler and Charlie invited two members of the well-known space rock group, the guitarist and leader Ed Wynne and the keyboardist Joie Hinten. So is the side-project turning into a pale copy of its elder brother? Not at all. Side 1 is maybe the most eclectic. From the beginning, you know you're in for something special. "Birth" is short introduction to the spacey ethereal "Parallel Vortex", the entrance to a strange unknown quantum universe. Mysterious eerie xylophone bells, esoterism, and then robotic retro-futuristic ambiance... A very fine opening for such cassette! On the opposite, "Impossible Maze" is a HAWKWIND-like song with raging riffs and screaming vocals, however even more aggressive than the space warriors. This is nearly space punk! Nice and punchy, although a little repetitive. Then comes the house / early techno ramshackle "Bath - Scum", which foreshadows what Merv Pepler will be offering with his future band EAT STATIC. Again, cool but too monotonous. "Tammiz I" is a more concise version of the GONG-esque track "The Eyes of Tammuz" from "Forbidden Pastures", whereas "Weeping" is a short enchanting interlude and "Sherbert Lemons", a soothing electronic title in the style of 90's OZRIC TENTACLES. No time to rest, the growing Middle-Eastern-ish saturated pysch jam "It's Only Paranoia" reminds HAWKWIND's "You Shouldn't Do That" at times with its various percussions and sound effects. Truly one of the best tracks of the cassette, "False World" begins with a terrific trippy gothic opening and a catchy futuristic galaxy conquering melody. Mindblowing! This can easily compete with Captain Brock and co.'s best 80's material! More modern, "Flabby Abo" and its digeridoo immerses us in some strange mystical ethnic temple. "Immortal Souls" consists in a dark psyched-out electronic loop, a bit too lengthy, while "Light From A Nebula II" is a rearranged and better balanced version of the cosmic adventure "Light From A Nebula" from WOODEN BABY's first tape, "Stuck In The Mind-Cage". Side 2 still holds several surprises. The atmospheric "Astral Highways" interlaces a saturated floydian guitar with floating synthesizer patterns. Cool. The Indian female vocalizations samples of "Darjeeling" reminds me ASHRA's minimalistic exercise "Twelve Samples" from "Walkin' the Desert", released one year earlier. However, the rest of the track differs, as it possesses gorgeous bass lines and alternates with cold wave-ish sections. Back to meditation with the slow "Bali Sun", a mysterious ritual mixing Indonesian and Japanese sonorities, and to retro science-fiction with the sequenced "Amniote Egg". Weirdness and fuzzy logic return with the experimental "Hiccup" and its discrete Egyptian theme. Fun but does not justify its 3 minutes duration. "City Of 1000 Suns II" is short piano revisit of "City Of 1000 Suns" from the first tape, whereas "Exorcism I" is a more concise and dynamic rearrangement of the spacey new-wave song "Exorcism of Anu" from "Forbidden Pastures". "Ominous Omness" concludes the short and medium-length tracks collection, its electric violin will let you lost in the depths of the cosmos. Now we can accost the two long ending titles. Fasten your seat belt. "Friday The 13th (Full Moon Fever)" is a rapid space synth metal instrumental jam, displaying an atmosphere à la John Carpenter. Pulsating, frightening, raw, this is like escaping in the dark from an invisible threat. The perfect soundtrack to a 80's horror movie! The cassette finishes with the great energizing "Cocoon (Excerpt)", an incantatory futuristico-mystical theme, deep and mesmerizing. Violin, guitars, keyboards, ethnic instruments, everything is here. A powerful trance and a freaking good conclusion, well suited to end such a stellar patchwork, and completely in opposition with the ethereal ambient opening! Wow! Despite some lengthy passages, "Embalment" is part of the most original and eclectic psychedelic / space rock releases that offers such a wide and uncommon variety of styles, even more than on "Stuck in the Mind-Cage"! Songs, instrumentals, short, medium, long tracks, space rock/metal/punk, retro-electronic sequences, ambient house, ethnic percussions, violin... A genuine trip into unknown galaxies. The surprise effect remains, while the approached music styles both cover the eighties and unveils future things to come in the nineties. 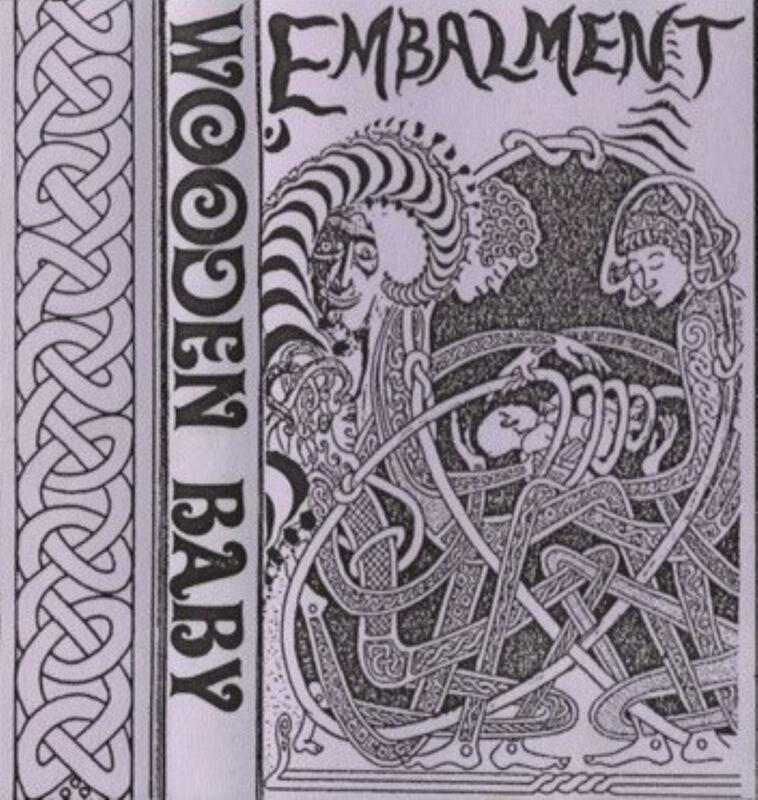 With its third and unfortunately last tape, WOODEN BABY just gave birth to undoubtedly one of the best space rock recording of the beginning of the 90's, released in a transitional time period when the very genre was about to renew itself with the second psychedelic and electronic revolutions. Not the one to begin with, nonetheless essential for 80's HAWKWIND and OZRIC TENTACLES lovers!